Entering the lecture theatre at SOAS, I was taken aback. Three tiers of amphitheatre seating were stuffed full. People sitting on the stairs, on the floor at the back, standing at the sides, crushed up against the wall, craning their necks to see the projector screen. I am reminded, oddly, of witnessing the clamour to catch Slavoj Žižek talk in a similar room, not far from here, a decade or so earlier. But today’s two speakers have published few books, are not known for writing contrarian op-eds. They are not the stars of any films. They are both young, straight-talking, not prone to wild flights of circumlocution. One is bespectacled, American-accented, precise in her tone, even a little cautious in manner; the other seems a little warmer, more laidback, perhaps. She place a half-drunk bottle of Coke on the desk beside her paper and announces that she is seven weeks pregnant and might possibly have to run off to vomit, mid-speech. Their names are Diann Bauer and Helen Hester, both members of the collective Laboria Coboniks, their name an anagram of the French maths group who wrote collectively as Nicolas Bourbaki, making important contributions to set theory in the early twentieth century. “No more futureless repetition on the treadmill of capital, no more submission to the drudgery of labour, productive and reproductive alike, no more reification of the given masked as critique. Our future requires depetrification. XF is not a bid for revolution, but a wager on the long game of history, demanding imagination, dexterity and persistence. Over the course of its rich and eminently readable 150 pages, one encounters the alien futures of Lee Edelman, Shulamith Firestone, José Esteban Muñoz, and Donna Haraway, the DIY tech of 70s feminist groups, like the Del Em menstrual extraction device, slogans of the Chthulucene, transfeminism, and radical self-help. Two months after her lecture at SOAS with Diann Bauer, Hester and I met up in a North London cafe to discuss the manifesto, the book, and the ultimate chemical weapon. Let’s start with Laboria Coboniks. How did you come together as a group? We were at an intensive philosophy summer school called ‘Emancipation as Navigation’ in Berlin – a 12-day event exploring rationalism, universalism, and emancipation. Many of the speakers and participants knew each other, or knew each other’s work, and came from a loose tangle of positions around neorationalism, transmodernism, and speculative realism. I was very much an outlier in this context. A couple of the members of what would later go on to become Laboria Cuboniks had been invited to teach sessions there (I was talking about Shulamith Firestone and the limited possibility of re-engineering embodiment through technology); the other members were there in attendance. In the course of general discussion, the topic of Accelerationism kept coming up – The Accelerationist Reader had been published just a couple of months before, so it was sort of on everybody’s minds. Much of this discussion was quite critical - I personally found some elements of Accelerationism quite frustrating, not least the fact that it was somewhat oblivious to much of the feminist work on science and technology that struck me as a key part of its lineage. There was nearly fifty years of work – at least! – that was being overlooked. So, I was really keen to reinsert theorists of gender into the stories that were being told about the contemporary political moment. After one of the lectures, I raised the question, what would a feminist accelerationism look like? And, relatedly, what would an accelerationist feminism look like? That initiated quite a big discussion – one born out of comradely critique and a shared set of investments, as much as feminist irritation – and the six of us who would become Laboria Cuboniks all sort of drifted into each other’s orbit. We had a shared interest in stripping Accelerationism for parts, really – we sort of wanted to appropriate elements of its approach instead of rejecting it outright, which set us apart from a number of other feminist critiques at the time. We thought there were interesting ways that we could make use of it. We promised each other we’d stay in touch and collaborate on something. You know how it is after lectures and events – you start chatting to interesting people and you start making plans to work together in the future; “Oh, we should definitely do something! We should unpack this, we should build that!” So I said, yeah, of course, not really thinking that anything would come of it but glad to have the email addresses of so many cool women. But something did come of it – we ended up collectively writing “Xenofeminism: A Politics for Alienation.” It was all done via an Etherpad document and a few Skype calls, which was really hard to do because, of the six of us, at that point, we were living across three different continents and six different countries. So managing different time zones was really tricky! But there was enough will amongst the six of us to get the ball rolling, and positive things started to happen. 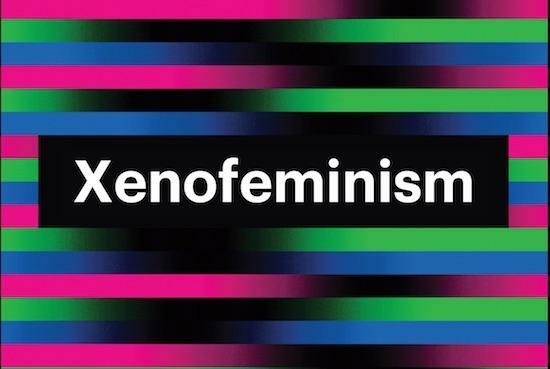 So if we’re relatively familiar with what feminism means – the degree to which Xenofeminism might unsettle that meaning notwithstanding – but perhaps the less familiar element of the name is this prefix, Xeno–. Now as a one-time teenage science fiction fan, I am reminded of Xenobiology, this idea of something quite alien. But what function is this prefix performing in Xenofeminism? There are obviously science fiction resonance here, yes – particularly with the work of Octavia Butler, who is very much beloved amongst some members of Laboria Cuboniks! More generally, though, the prefix comes from the Greek ‘xenos’, meaning the stranger, the outsider, or the alien. Crucially, we’re looking to develop a feminism that is hospitable to difference – one that’s more capable of fostering solidarity without assuming sameness as a prerequisite – and we’re trying to think philosophically about what that might look like and think practically about how we could build it. In the book I talk about the generation of new kinds of support networks, and about xeno-hospitality as a commitment to forging alliances beyond the mere replication of the same. That to me is one important implication of the xeno in xenofeminism. The idea of the alien relates also to xenofeminism’s self-image or attitude towards itself. If you are looking to create a gender politics that is hospitable to difference, to the unforeseen – to perspectives that you may not be able to imagine from your own limited vantage point – you have to keep a space open for this. The project has to be revisable, open to dissent and to change. To a degree, then, it has to remain alien even to itself. There are numerous other dimension of the ‘xeno’, too, which stem from its relationship with various, broader understandings of alienation – alienation is a highly polysemic word! We quite self-consciously play on this at different points in the manifesto – Marxist alienation, alienation through technology, alienation through our very capacity for abstract reasoning. In one way or another, all of these ideas come to be woven together to make up the fabric of xenofeminism. In the manifesto, we frame alienation as a generalized condition – one that, rather like capitalism itself, possesses both differentiating and universalizing tendencies. (Alienation may be a common experience, in other words, but it’s very clearly an unevenly distributed one – no matter in what sense we are using the word.) But rather than framing alienation as something that always and necessarily needs to be fought against or avoided – a condition to be overcome before any meaningful constructive project can begin – xenofeminism argues that, in certain circumstances and under particular conditions, alienation might actually be something we can use in a productive way. Hopefully! I mean, we have to begin from where we are; we can only build a more emancipatory future from the resources we have to hand. This is why we need to look at what can be done from and via various positions of alienation – how we might turn certain kinds of experiences of alienation towards more politically productive uses. Our use of the idea of the universal has been one of the most controversial elements of the project, actually, and I think that stems from people’s quite justified anxieties. I always try to be very careful. If you’re going to try to redeploy a concept like that you have to think critically about why people have been wary of it in the past, and what the problems might be in trying to take these ideas up now. A lot of feminist work, including within feminist post-humanism, has been really astute about the way universalism has historically been thoroughly unrepresentative – not really a universalism at all, but a bloated particularity. White, heterosexual, male citizens of countries in the Global North have come to be confused with the “universal subject”. And the feminist work that has challenged this has been massively influential and important, crucial in terms of steering the way these concepts can go now. It is beholden upon anybody trying to make use of the concept of universalism today to ingest the insights of these critiques and to take them seriously. For Laboria Cuboniks, the universal is synthetic – it’s a political category. It’s not something that is discovered, or progressively unearthed, but represents a ‘we’ that is collectively built, and which can be rebuilt in more emancipatory forms. Again, this can be understood as an effort to construct vectors of unanticipated and constructed solidarities. I see this as being in direct opposition to the bloated particularity that has conventionally been passed off as the universal and which has largely cornered the market on popular understandings of the generic since the Enlightenment. Xenofeminism doesn’t want to reject universality – though I totally understand the impetus – but instead wants to contest and re-engineer the universal. I’m of the opinion that we can still use the category of the universal to do important things. A lot of the claims that we make for equality, human rights, social justice, and so on are founded upon some version of this idea, and, pragmatically speaking, I don’t think we are yet in a position to give up this kind of claims-making. Indeed, as much as capitalism is a differentiating force, splitting people up into different groups so that they can be exploited more efficiently, it’s also a universalising force, inasmuch as it’s a global system that largely defines the horizons of possible action right now. So you need a (carefully qualified) universalism that can reckon with that. If we are going to take the risk of advancing large-scale, counter-hegemonic feminist projects, I think we have to engage with debates about the operation and constitution of the universal – I think we need to combine rigorous criticism of the way Enlightenment forms of universalism have operated with efforts to work towards more universal universals. Turning to your new book. My wife is a GP, and sometimes when I was reading some of this suff about the Del Em and these kind of DIY medical exploits, I could sort of hear her voice in my head, almost screaming. Isn’t there a degree of danger in some ways in encouraging this sort of experimentation? I think it’s important to acknowledge that there really are a lot of risks associated with these practices. I wouldn’t argue that they are desirable in and of themselves, as a kind of endpoint to the xenofeminist project. The way I see things like the DIY abortion movement from the 1970s and a lot of the DIY stuff that’s happening in some trans communities today is that they represent a form of bio-technical self-defence – a way of coping and surviving when other options are somehow limited. They help people carve out a space of autonomy within healthcare systems that are sometimes restrictive, inaccessible, and difficult to navigate. I mean, it’s very unlikely that I would need to use a Del Em to abort a pregnancy in England today, because I have much more access to medical abortion than people in the US had before Roe vs. Wade. The situation of people in Northern Ireland, the Republic of Ireland, Poland, and numerous other countries around the world is quite different, of course, and I’m all too aware of the persistent threats to restrict access. Access to abortion remains a pressing issue in the States, for example, where recent studies have shown that Google searches for instructions for self-abortion have shot up. This is particularly the case in states where the number of clinics is limited, so it’s very difficult for people to physically get to somewhere where they’ll be offered care. The material barriers in terms of cost, in terms of time, make abortion inaccessible for some people in these circumstances. Before Roe vs. Wade, the feminist self-help health movement was really an attempt to exert bodily autonomy: it gave some women some agency over whether or not they would be forced to carry a child that they couldn’t take care of or simply didn’t want. DIY abortion was not necessarily people’s first choice, but it was one of their only choices. This is why I frame it as an act of self-defence. Feminist health activists of this period sought to take these conditions and turn them into something more positive – they made DIY abortions as safe, cheap, and accessible as possible, and tried to make the self-help group a source of community and support. Some elements of this are quite close to aspects of contemporary trans health. Trans people may well prefer safe, well-tested – ethically tested – pharmaceuticals, that they can access easily, and not at great expense, without a significant risk of self-endangerment. But access is a massive issue – a life and death issue for many people. Two thirds of trans youth and one third of trans adults have attempted suicide. If the official means of accessing hormones and hormone blockers, for example, create significant barriers for some people, they will find alternative routes. And what’s quite interesting about the circulation of information within online communities and the circulation of drugs via the grey- and blackmarkets is that it has become one way of indirectly agitating for better forms of standardised care. The availability of pharmaceuticals has shifted the gatekeeping power dynamic. So, the Royal College of Psychiatrists published guidelines a few years ago that explicitly acknowledge that, given the ways that pharmaceuticals travel today, there are new risks associated with refusing to prescribe hormones and hormone blockers – people will simply find them for themselves if they denied care by their doctors. GPs are therefore advised to issue bridging prescriptions before specialised gender identity treatment (treatment that can involve long wait times). But whilst these forms of biomedical self-defence have their uses, I think that the conclusion of the book points to the fact that we need accountable systems, we need the infrastructure to make sure that access is as universal as possible, and that treatment is as safe as possible, that the people who are administering or prescribing drugs are actually trained to make sure people don’t have counter-indications and won’t face unnecessary health risks. I think that individual seizure of bodily autonomy is a way of surviving in the here and now and of pushing for wider changes simultaneously. I don’t think it necessarily represents an end point in itself, so much as a means of doing something – another kind of tool. I think that’s a very different case – interventions around gender won’t necessarily map onto different forms of intervention in quite the same way, and the possibilities of abolition through proliferation will really depend on the character of the thing we’re seeking to abolish. My argument for gender abolitionism is, as you point out, not about getting rid of difference, so much as getting rid of the idea of a gender binary (an idea which, as many decolonial feminist scholars have pointed out, is itself distinctly European – part of a system that was imported and imposed upon different ways of understanding identity). As long as we continue to gather people into two camps – camps which somehow manage to be both broad and restrictive – we’ll be prompted to make knee-jerk judgements about each other. Men will be assumed to be more aggressive, less empathetic, and less capable of nurturing others; women will be thought of as less rational, more emotional, and better suited for care work, and so on. People who don’t fit neatly into either category will find themselves stigmatized, abused, or (if they’re lucky) ignored. When people are grouped together under the banner of ‘male’ or ‘female’, I think gender is given an unwarranted degree of significance. It operates as a kind of cultural shorthand, supposedly telling us something about who people are – their likely habits, preferences, abilities, and so on. Given that we tend to value ‘masculine’ and ‘feminine’ traits rather differently, this process of categorization supports various forms of hierarchy, too. We have kind of learned to group people into two broad camps, and then to project certain, differently loaded, qualities onto them as a result. So despite its name, gender abolitionism is not a destructive project, but a creative one. It’s a call for a world in which there are lots of different ways of doing gender - so many, in fact, that it doesn't make sense to use gender as a means of categorizing people at all. It becomes far too complex to map character traits onto people in this way. This idea kind of taps into an existing moment of proliferation in the Global North – a moment in which people are already slicing gender up into all these different subgenres. But on its own, this proliferation feels quite limited because it just gives us more and more specific ways of categorising people. So, xenofeminism sees this moment as potentially transitional – it wants both to channel it, and to refuse it as an endpoint. The emergence of multiple genders is really just a first step in refusing to accept any gender as a way of explaining social roles, justifying discrimination, and so on. So to what extent was the process of writing this book also a process of you working out how you feel about your own pregnancy? I wasn’t pregnant when I wrote the book! In fact, I had very little intention of ever becoming pregnant, so it’s been a big shift. I’m glad I didn’t use the book to argue that all human reproduction is fundamentally unethical or something! I might be feeling slightly conflicted right about now. But you could certainly interpret some of the book as being about people’s right not to procreate. But you do also chip away at some of the feminist arguments against reproduction – Haraway’s included. In some ways, you’re creating a political and theoretical space for yourself to be comfortable with your own impregnability. Bodily autonomy has to be our starting point for a lot of these discussions and a lot of these debates. Partly that is about having the right not to bear children if you don’t want to, but the other side of that is trying to ensure that people who do want to have children are able to do so in conditions of safety and support. These conditions have not been evenly distributed, by any means, and this is something I try to address in the book, drawing on the insights of the reproductive justice movement and the writings of feminists of colour. Also, the book talks about trying to de-centre the biological family by creating cultural spaces for alternatives – trying to disrupt the idea that there are correct and incorrect ways of being a socially reproductive unit. There are people who have historically been excluded from the framework of “the family” for various reasons and that framework just doesn’t work for a lot of people. It can be a very oppressive thing, the family, I think. One of the xenofeminist tasks we should set for ourselves is to create the conditions whereby the family stops being the centre of the way we conceive of what’s possible for social reproduction. There’s got to be a move towards having alternative institutions for social reproduction, different ways of enjoying intimacy and solidarity, but also broadened state provision for taking care of people who aren’t part of traditional family units. I think that’s quite an important thing – even as I’m in the process of actually incubating a foetus, and being very much subjected to ideologies of the family from all sides! Recently, I’ve started saying that the baby is the ultimate chemical weapon. It makes you feel things that you might not want to feel. Very strange to be on the receiving end of. It’s a bit of an unexpected adventure. I think this is one of the major ways that xenofeminism reframes Accelerationism. I think Accelerationism has been widely positioned as a form of destruction – a movement primarily interested in razing things to the ground, in the idea that capitalism will reach a certain pitch or intensity in which everything we know will be destroyed. There’s a real interest in some quarters in the moment of destruction, and not that much interest in what happens after. Yeah. I was speaking to the artist Linda Stupart about this the other day. They were talking about how that version of Accelerationism is rather like a roundabout in a playground. There are these Accelerationists in the middle, making everything spin faster and faster and faster. But it’s the people on the peripheries who get flung off. And yet I think, the post-millennial version, the [Nick] Srnicek and [Alex] Williams version, of left Accelerationism, is much more interested in what happens after, pushing through capitalism to get to something else – hopefully something more emancipatory, something more liberatory. I think my way of framing it is that Accelerationism can be understood (or at least, deliberately reinterpreted) as engaging with a process of repair. So unlike some anarcho-primitivist visions which are like, in 500 years we’ll have total systemic collapse and then we’ll start again, it’s more like, we are where we are, we’ve got a lot of broken and damaged things, but there’s also lots of possibilities amongst these broken and damaged things. A reparative Acelerationism gives xenofeminism something to salvage. How do we start from this moment, where we are right now, and move forward? It just seems misguided to start from the idea that we have to burn everything to the ground and start again – whatever form that burning takes.